A successful home audio video system (whether indoors, outdoors, or both) comes down to an efficient installation. This is especially important when moving your entertainment outside since you have to cover more ground, and you need to find a way to protect vulnerable equipment. First, the experts at Profocus Home Entertainment meet with you to see what you're looking for. How many speakers do you want? Do you also want an outdoor television? Do you want to create distinct entertainment spaces? Once we have the answers to these questions, we do a thorough pre-wiring to prepare the area. This prewiring is important since it lets us keep your source components indoors, so they don't have to stand up to the harsh outdoor conditions. We then use matrix switchers and AV receivers to relay the signal to your weather-proof equipment. With stylish, affordable options available from the top manufacturers in the industry, there’s no reason not to invest in speakers and televisions specifically designed for outdoor use. Profocus Home Entertainment can serve as your technology adviser, helping you find the best options for your space. We recommend going with a Seura outdoor TV. Seura televisions are specially built to stand the rough conditions and include strong anti-glare technology so you can watch even with the sun is directly hitting your equipment. For your audio, you can go with Klipsch’s outdoor speakers that come in traditional and rock models. These speakers offer the same high-fidelity sound that customers have grown to love in their home cinema lines. Another alternative is the more subtle Sonance Sonarray line which blends in with your outdoor foliage. Since your source components will be hundreds of feet away, a traditional remote is not enough for your outdoor entertainment. This is why we connect your home audio video system to a waterproof URC remote perfect for outdoor use. The MXW-920 waterproof remote control can manage sources even when they're not in the same room by communciating through a URC base station. While we don't reccomend taking it for a swim, the remote can handle liquid and mixture so you can use it by the pool without worrying about getting it wet. At the press of a button, you can find the playlist you want or pull up your media library to watch a movie. From the same remote or app you use to control your speakers and TV, you can adjust your landscape lighting when it gets dark to keep the party going. 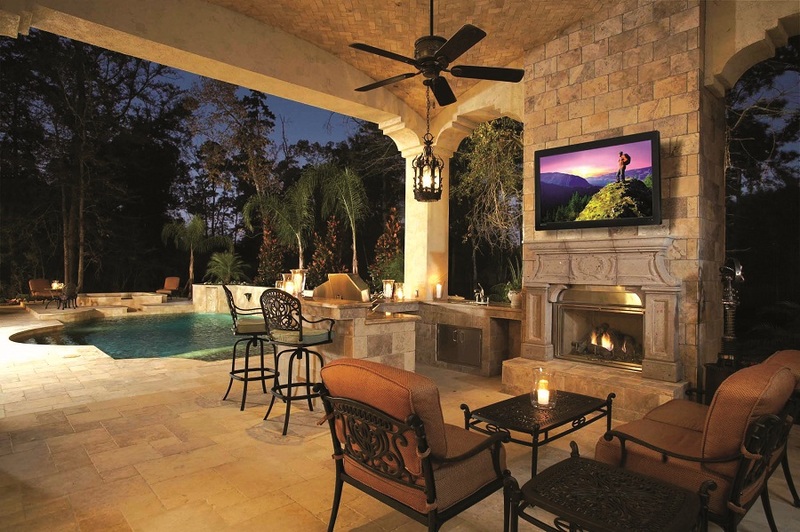 Take advantage of the warm weather with an outdoor entertainment system that will impress friends and family. Contact ProFocus Home Entertainment to set up a consultation.